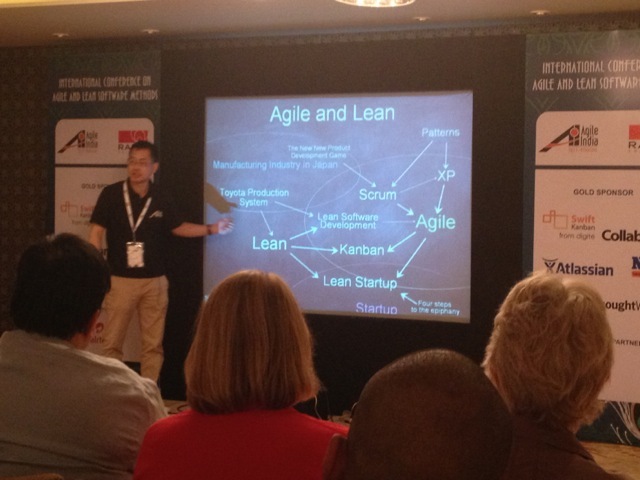 Agile India 2013 was an enagetic and eye-opening event I just attended in Bangalore. Here are some photos taken during my talks. (Edit: Mar.7 Added) Here’s a mind map note I took for Craig Larman’s keynote speech. He made two bad jokes, but I almost forgot :). But he made a very good point about the real meaning of “Customer Collaboration”, by using flip charts and a skit by three local engineers. I’ll remember the business side’s “more more more” and dev. side’s “less less less” mindsets once the goal is separate. I did the following three talks. Each has a link to the slides. (Edit: Mar.7 Added) Bruce Talyor(@rooosterboy) took a note of my talk as an awesome mind map. This is the one I really wanted to talk to the world this time. It describes how Japan is behind in Agile adoption, although the word “Scrum” is born in the context of new product development in Japan in the 80’s. 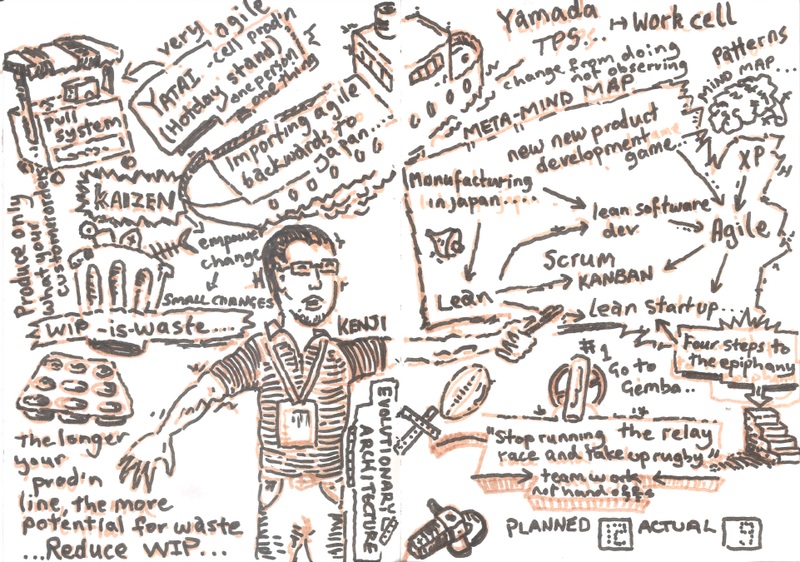 To me, Scrum has been discovered by the western software development culture, and was imported back to Japan now. In the original Scrum concept which is not really associated to software, there are some more to revisit in the current movement of Agile. See my blog entry that discusses Nonaka’s other ideas which can be applied to the current Agile practices. This is my pet talk, too. Mindmapping is a flexible tool to gather information and to share understanding in a group. I talked why mindmapping is good for creative group activities, showed a lot of examples, and then how you can benefit from mindmapping in a user interview session using a short “skit” with Satomi Joba. All the talks went well although I was so nervous before every talk ! And in “Product Demo” I showed Astah, a mind mapping tool. I’m sending free licenses to those who asked me to via email. Please let me know if you got interested in the mindmapping tool and haven’t received the email from me yet(For more about this special give-away for attendees, visit here). I got reunited with “Agile-All-Stars” including Linda Rising, Mary+Tom Poppendieck, David West, Craig Larman, Kevlin Henney, Jeff Patton, Laurent Bossavit, Karl Scotland, Masa Maeda and Henrik Kniberg. It is always good to talk with them personally. This was my first trip to India, and people were so nice to me. I won’t forget the dinner with the local engineers Prem Muthedath and Bhavin Kamani, and also the nice chats with Sven Nilsson, Rebecca Rikner, Jagadeesh Balakrishman, Evelyn Tian, Swati Garg, Anuradha Gajanayaka, Suprika Shrivastava, Ram Ramalingam, Mahesh Varadharajan, and …. the list goes on. Last of all, I’d humbly like to thank the team including Annu Augustine and Naresh Jain, who organized the fabulous conference and invited me to talk there. I’m so proud to have been part of it. Also this time we were able to visit Premnath, KN – a member of Friends of Astah and explored Bangalore city with his generous hospitality. Thank you Prem. 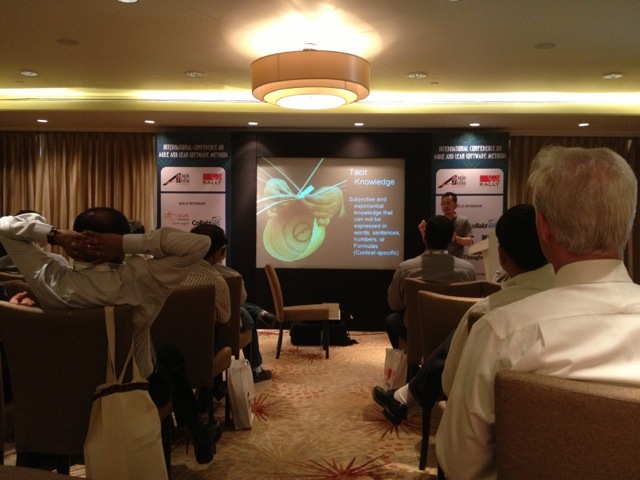 This entry was posted in Agile and tagged Agile, AgileIndia. Bookmark the permalink. We were very glad to have you here Kenji. Your humor and humility were very touching. Your talks were super. Special thanks for your “Drink Lean from the source” talk..
Hi Kenji, your talks were very insightful and I got some valuable take ways from it. Thank you! again.